Organic Farm with swimming pool, family-run, 3 apartments for a total of 7 people + 4 double sofa bed. The farm is located near Siena and the wonderful castle of Monteriggioni, a medieval castle remains unchanged with time and enclosed in 14 towers. The owner family lives in the farm, where he is responsible of its customers and the cultivation of vegetables, fruits, wine and organic olive oil. The apartments are elegant property located near the residence of the owners and consist of a bedroom, bathroom and living room with kitchenette, from the windows you can enjoy a spectacular view of the vineyards and the castle of Monteriggioni. 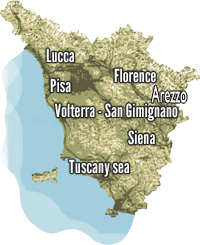 The campaign, scenic beauty and proximity to Siena and Florence are the requirements for a perfect holiday in the Tuscan style.